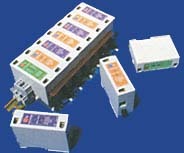 These modular distribution panel bowthorpe protectors for three phase power systems are designed to prevent damage to electrical distribution systems from mainsborne transient voltages which can occur as the result of nearby lightning strikes or surges derived from the switching of inductive or capacitive loads. They feature exceptionally high surge handling capabilities of 90kA, 150kA or 300kA and are intended for high lightning exposure areas and critical systems where long life and low maintenance are required and far exceed the recommendations of BS6651. The Bowthrorpe Modular Distribution Surge Protector (MDSP) should be installed at the point of cable entry to a building containing sensitive electrical or electronic equipment. The MDSP is normally used as part of a totally integrated surge protection system and as such should be considered as the first line of defence. Local distribution panels and equipment connected 'downstream' should also be protected in order to achieve a systematic and co-ordinated approach to surge protection. The Bowthorpe MDSP provides suppression from mainsborne voltage spikes and surges that can occur between phases, phase to neutral, phase to earth and neutral to earth, thus ensuring protection in all modes. This protection is achieved by using carefully matched high energy absorbing elements. The MDSP features exceptionally high surge current handling capabilities which operates in two stages to ensure continuity of transient suppression. Under normal conditions the MDSP will automatically reset after clamping smaller, more commonly occurring surges, and two green lights on each of the Line modules indicate that full protection is present. However, should a surge current in excess of 90kA, 150kA or 300kA (depending on the model selected), appear on the line it will be clamped by the MDSP but the first protection stage may possibly suffer damage and fail safe. In this instance one green light from each damaged module will be extinguished and although the system will still be adequately protected, affected Line modules should be replaced before a further large surge can remove the second stage. There is no protection present when the Bowthorpe green module lights are not illuminated, although unprotected power is still supplied. The Neutral/Earth module is provided with a red warning light. Should this light glow at any time it is not a warning of suppressor failure, but, is indicative of potentially hazardous site wiring. 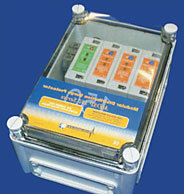 Each MDSP module is fitted with a remote signalling facility where volt free terminals (which can be connected as either normally open or normally closed), open or close when the first protection stage is lost, (one green light on) and these can be used to activate a remote indicator such as a lamp or audible alarm or notify a building management system (BMS). An alternative version of the Bowthorpe MDSP is available which in addition to the above is also provided with Silicon Avalanche Diode (SAD) modules which offer extremely low clamping and exceptionally fast response time. This makes them ideal for the stringent and demanding requirements of, for instance, mobile telecom applications.